This morning's installment of Find the Kittiwake at Costa del Este had mixed results. Rosabel and Karl Kaufmann, George Angehr, Venicio Wilson, Jan Axel Cubilla and Darién Montañez were unable to find the needle in the haystack, but had some nice consolation prizes anyway. 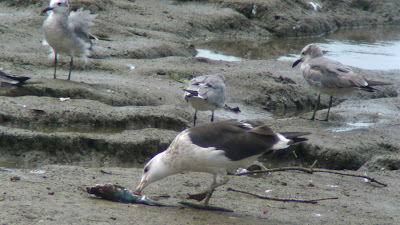 Top on the list was a presumed Kelp Gull of mysterious age, amply photographed. The legs (whih were dull greenish yellow) were not bright enough for anything else that came to mind, but somehow the back color didn't seem black enough, and the bird had too much dusky on the face and nape. 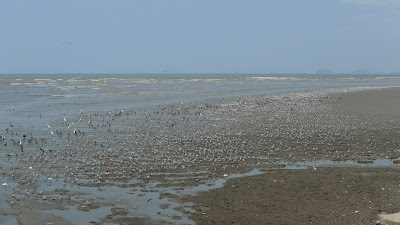 The flock had more Ring-billed and Herring Gulls than any of the participants had ever seen together at once. 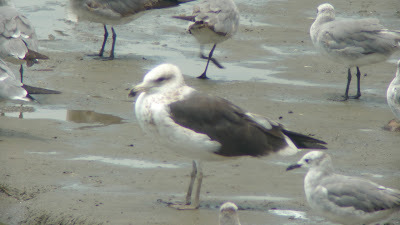 Also present were about a dozen Black Skimmers of the South American denomination (i.e. 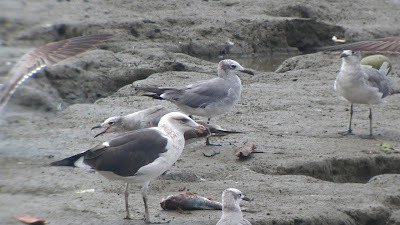 with little white on the tail, dark underwings and little red on the bill), a dozen or so Elegant Terns, a Caspian Tern, and a Franklin's Gull. We'll probably hit Costa del Este again tomorrow at noon, so more photos and speculation are on the way.